Evangelism: In obedience to Jesus’ Great Commission we understand that both individual Christians and the church corporately are to take the Gospel to all people groups—locally and globally. We emphasize personal evangelism, not as a chore to be carried out under compulsion, but as a privilege and prime way to display God’s glory. To view our latest evangelism emphasis see www.whosyourone.com. For additional information on how to reach your neighbors for Christ see www.sbcv.org/blesseveryhome. Members at HCF have agreed to support our mission endeavors through gracious giving, faithful praying, and physically going—whether on a plane to another continent or across the street to a new neighbor. We gladly and enthusiastically support Southern Baptist missionaries on the field worldwide as we give through the Cooperative Program of the SBC. For more information on Southern Baptist Missions worldwide see www.imb.org and www.namb.org. For more information on Southern Baptist Missions in the Commonwealth of Virginia see www.sbcv.org. It has been our joy to support Samaritan’s Purse Ministries through Operation Christmas Child. Each fall our members have both filled shoe boxes for overseas distribution and worked in collection and distribution centers at the national level. Other Missions Emphases at HCF: In addition to supporting missions through national and state agencies, we are especially excited to partner with the following Gospel ministries. Belarus: Near and dear to our hearts is our sister church in Druisk, Belarus. We love and support the Druisk Baptist church financially, prayerfully, and practically—through short-term mission trips at least once yearly since 2009. Druisk Baptist Church ministers and supports HCF through prayers and their glaring example of hospitality and true brotherly love as they minister daily in the small village of Druisk and as they receive us on our travels. With the advent of advanced communication technology, HCF and DBC meet quarterly via video tele-conferencing. Pregnancy Resource Center Richmond: We are proud to stand with those who stand with the unborn. Since March 2019 HCF has partnered with PRC-R through financial support and in various other practical ways. **If you are experiencing a “crisis pregnancy,” simply want to talk with a trained counselor, or want to learn more about PRC Richmond and their services go to www.prcrichmond.org. 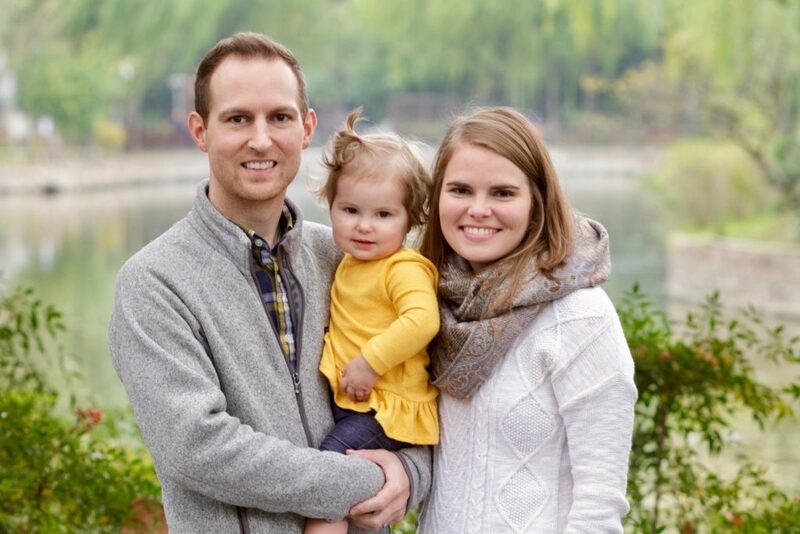 Ryan and Kristin: Kristin grew up as “one of us” and we are excited to partner with and support Ryan and Kristin as missionaries in Asia. Ryan and Kristin originally met in East Asia, were engaged there, and now live there long-term for the purpose of seeing the gospel of Christ spread among some of the most unreached people groups in the world. They are part of a team of experienced missionaries whose work involves evangelizing unbelievers, discipling and equipping believers and local pastors, and planting both international and indigenous churches. They have a daughter, Reagan, who is one year old. Liberation Veteran Services: LVS is a local Richmond, VA, social service support facility to homeless US military veterans. HCF provides meals and evangelistic/discipleship ministries at LVS about 20 times per year. For information on how you can assist with this ministry, please contact Barry Taylor using this form. Pamunkey Regional Jail: Rev. Hiram “Buddy” Pritchard, chaplain at Pamunkey Regional Jail in Hanover County, is a member at HCF. Under Rev. Pritchard’s leadership, HCF members minister to inmates primarily through teaching and by providing support for necessities including Bibles. For information on how you can assist with this ministry please contact Buddy Pritchard using this form. Richmond Center for Christian Study: RCCS ministers to University of Richmond students. The RCCS’s mission is to bring gospel transformation by fostering serious consideration and discussion of a biblical worldview and its bearing on all of life and culture. For more information see www.richmondstudycenter.org. Ben Bennett: Ben currently resides in Dallas, Texas and serves with Josh McDowell Ministry as an author, speaker, and evangelist supporting the health and restoration of men and women struggling with hurt, habitual sin, and sexual brokenness. For more about Ben please see www.josh.org/ben.